Why do we commemorate Lent? Since about the end of the fourth century The Church has seen fit to set aside forty days for selfexamination, repentance, reconciliation and restoration. In the early Church, Baptismal candidates (known as Catechumens) who were completing a three year preparation to be baptized used the forty days for their intense, final preparation for Baptism at the great Easter Vigil. “Notorious sinners” used the same period of time, through acts of penitence and self-denial, to prepare to be restored to the Church. In modern times the season of Lent is designed to help us enter into the mystery of the Resurrection through our own period of penitence, fasting, reconciliation and restoration. Has it always been 40 days? No. Early Christians set aside several days of fasting (three to seven depending on where they lived) to prepare for Easter. 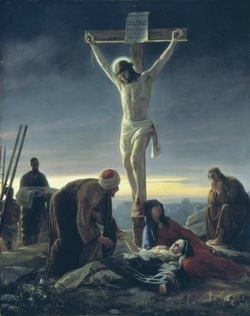 For about two centuries most Christians observed only Holy Week. About 600 years ago three weeks of “pre-Lent” were added to the forty days with names like Septuagesima and the like. These were dropped from our Calendar in 1979. I’ve seen Churches use Purple and something that looked like burlap with Red and Black stripes. Which color is the “real” Lenten liturgical color?The simple answer is both. Purple is generally associated with penitence and mourning, and has been used in the Church for hundreds of years. The “burlap” with red and black markings is called Lenten Array. It hearkens back to the early Church’s use of sack cloth, or unbleached cotton or wool, to signify extreme acts of penitence and mourning. The Church, in turn, borrowed the color from our Jewish forbearers, as described in the Old Testament (see Job). Either color is appropriate. Why do we have our foreheads marked with ashes on Ash Wednesday? We do this as a reminder of our mortality. The priest marks each person with the sign of the cross, while reciting, “Remember that you are dust and to dust you shall return.” Having been reminded of our fleeting existence on this earth, we begin to focus on turning that life around by confessing and renouncing our sins, forgiving and seeking forgiveness, so that we may be in harmony with God and our neighbor. From the palm branches used in the previous year’s Palm Sunday Liturgy. Parishioners are asked to bring them to the church just before Lent begins. They are burned and the ashes are used in the Ash Wednesday liturgy. Why are there no altar flowers and why do we cover or remove most artwork and statuary during Lent? The Lenten season is an unadorned season. Symbolically we try, in our worship space, our hymns and lessons, even in our sermons, to recreate a sense of our Lord’s 40 days in the wilderness. We set aside everything that might distract us as we journey with Christ to Calvary. By sharing in his passion we are more able to share in the glorious resurrection liturgy of Easter morning. Someone said we should fast during Lent. Is that a requirement? Our Church calendar (you can find it at the beginning of the Book of Common Prayer), designates “Ash Wednesday and the other weekdays in Lent and of HolyWeek except the feast of the Annunciation,” and “Good Friday and all other Fridays of the year in commemoration of the Lord’s crucifixion, except for Fridays in the Christmas and Easter seasons and any Feasts of our Lord which occur on a Friday,” as days to “be observed by special acts of discipline and self-denial.” Many Christians fast, (do not eat), until sundown on Ash Wednesday, and until 3 p.m. on Good Friday (the traditional hour of our Lord’s death). Others abstain (reduce their food intake, give up meat) as an act of devotion on these days, both in Lent and throughout the year. Fasting may not be right for you, but we are called by the prayer book for these days to be “observed by special acts of self discipline or self denial.” Speak with your priest or spiritual director for appropriate ways to mark these Holy days. What is a Lenten Rule of Life or Lenten Discipline? These phrases are interchangeable. During Lent, each Christian is asked to develop a Spiritual Rule of Life, which should include regular prayer time, self examination, perhaps adding attendance at a weekday service, self-denial (sometimes referred to as “giving up” something for Lent), abstinence and or fasting. Rules should be designed to help a person focus more clearly on the redemptive power of Christ’s atoning death and resurrection. A rule should be a spiritual aid, not simply a burdensome list of tasks to get through. When I count from Ash Wednesday to Easter I get more than 40 days. Why? Sundays are always feast days – even in Lent – because they commemorate the Resurrection. Subtracting those leaves 40 days. While you may technically not observe your Lenten Rule on Sundays (and the feast of the Annunciation) it is good Lenten practice to maintain the discipline throughout the season. (There are no exceptions for Saint Patrick’s Day, not even in Savannah!). What about Weddings and baptisms during Lent? There is no absolute prohibition against either during Lent, but centuries of tradition discourage festive commemorations unless there is a special pastoral consideration or an emergency. Many service members, for example, have been granted exceptions to marry in Lent, if they are scheduled to deploy into harm’s way. Easter or the Easter Vigil, once the only times persons were Baptized during the year, are the most appropriate times for public Baptism, along with the Day of Pentecost, All Saints Day or the Sunday thereafter, and the Feast of the Baptism of our Lord (the first Sunday after the Epiphany. (BCP, p.312). Do all Christian denominations commemorate the season of Lent? The simple answer is no, although more and more denominations are beginning to. In general, only those denominations that follow a Liturgical Calendar commemorate Lent. Traditionally, the three catholic communions, Rome, Orthodoxy and Anglicans, have been the denominations that have most often followed a calendar of Church Seasons. Lutherans, Methodists and a number of other protestant denominations are beginning to use a liturgical calendar. The major Church seasons are: Advent; Christmas; Epiphany; Lent; Easter; and the season after the Day of Pentecost (often called Ordinary Time).